This classic won’t make you say, “Wow!”, it’ll make you say, “Pow Wow!!”. Always a big hit anywhere you go, but this time Art uses bear to make his Indian Taco. Nothing overly complicated, but when cooking your bear meat please please please make sure you cook it until there is no more pink meat. 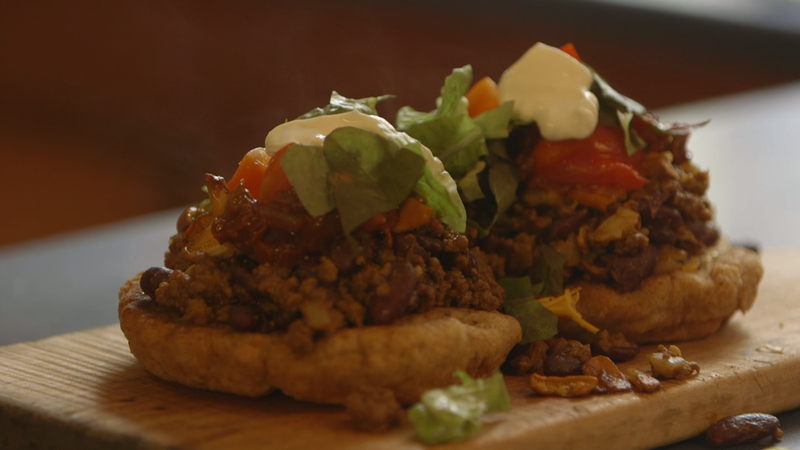 There are three main things to this dish, fry bread, beat meat and rose hip salsa! Everything else is up to you. • Melt 1 tbsp. butter or oil in pre-heated skillet. Let it brown slightly. • Add chopped onion and sauté until translucent. Then add chopped garlic. Sauté for 1 minute. • Add bear meat and brown. • Cook till there is no pink meat. This is very important. • Season with sea salt to taste. • Once meat is thoroughly browned add the kidney beans and chili powder. • Add touch of water if needed. • Boil the rose hip peel until soft then add your favourite salsa. • Fry chanterelles in remaining butter till they are soft and slightly brown at the edges. • Warm the fry bread in oven. • Serve the bear meat on top of the fry bread. Add warmed salsa and fried mushrooms, followed by desired toppings.